This book is from Light of Life, Villach, Austria, and has been translated from German. They offer many other materials also educating Christians about Islam. There are many good things that are out there about Islam and we need them all. 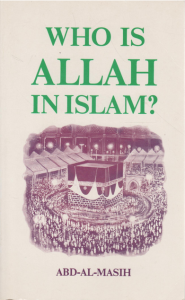 Masih educates the reader about the dangers and real intentions of the Islamic religion. “Allahu Akbar” means that “Allah is the greatest” (of any other expression of God) Islam cannot be separated from the culture it creates, specifically that the man is the god of his house and may do what he wants with his wife or children. Allah has no son! Christians are poly-theists. Jesus did not even die on the cross. There is no salvation doctrine in Islam.